Nonfiction text structures can be a daunting ELA topic to tackle in upper elementary classrooms. I remember the first time I saw it on the fifth grade state standards a few years back. (It was my first year coteaching in fifth grade, and I had worked with kindergarten and first grade ELLs the previous couple of years.) Whoa! I felt like a deer caught in headlights! The fifth grade teacher was hoping that I had a grand idea for teaching this topic, and I didn't want to let her down, so I decided to embrace it. It was a bit rough that first year, but I've come to really enjoy teaching text structures! The clipboard was a FREEBIE! by Charlotte's Clips! So cute and crisp! The text structure clipart is by Aim Less Daze. 1. Use visuals for each text structure (like the ones above)! 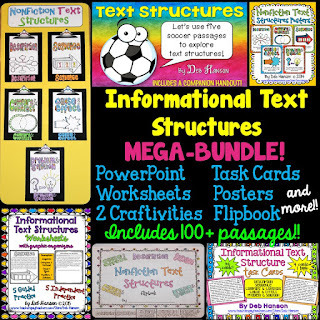 Students who understand and can explain how the graphic is related to the text structure almost always understand the concept of text structures overall. 2. Read several passages together as a class. This is a skill in which some students will need lots of guided practice! 3. Have students write their own paragraphs using each text structure. This seems to be the best way for students to internalize the various structures! I recently created a free and complete text structure lesson, and wrote a blog post about it. 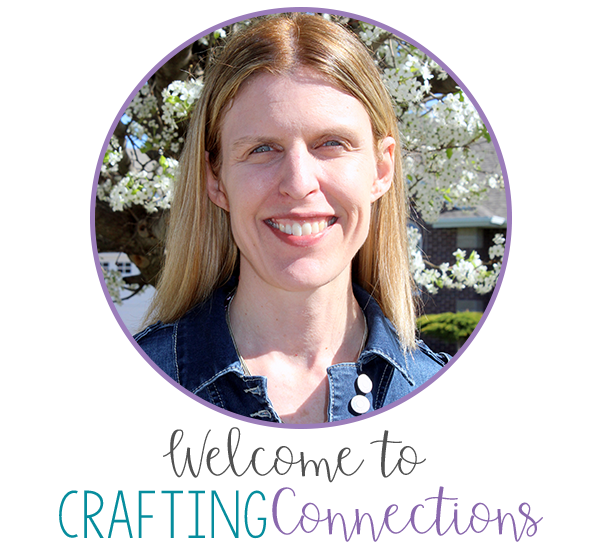 Click HERE to check out the post and download the FREE 23-page printable resource! Finally, I want to point out the incredible text structure graphics! They were designed by the talented Jena Flanagan by Aim Less Daze. Aren't they awesome?!? I contacted her and asked her to consider designing this set for me, and I sent her a very crude set of drawings! (I could only dream of being as talented as she is!) If you would like to purchase this set, click here! I colored the images on my anchor chart by hand because I was in a coloring sort of mood (and my daughter Brooke wanted me to sit down and color with her! ), but the set Jena sent me had blackline images as well as color images (the posters below will give you an idea what her color set looks like)! 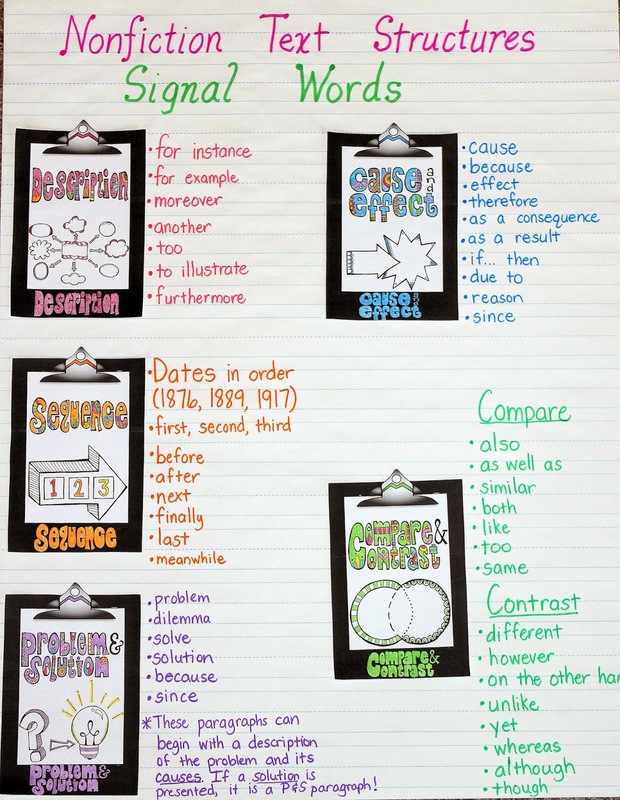 Deb, this anchor chart is amazing! I love the graphics that were made just for you. I'd want to look at this anchor chart all day if I were in your class! Where can I find a link to purchase the graphics for the chart? I love the design!